In the U.S. alone, construction spending totaled $1.13 trillion in 2016, with losses of $160 billion in building-related waste. At this rate, the smallest gains in construction efficiency can translate to billions in savings. Due to advances in technology, construction companies are increasingly turning to UAS to reclaim lost expenses. For starters, the construction industry is extremely complex—commercial and residential processes require skilled workers in multiple phases, requiring safety oversight, monitoring and data collection. That results in a long, expensive and complicated process—hiding a wealth of opportunities for increased efficiency. Drones can leverage those opportunities to maximize investments and improve safety. From planning to inspections, drones are making the construction industry safer and more efficient. They’re cheaper to fly than manned aerial vehicles, and collect more data in less time than human surveyors. Drones also help construction workers track a site’s progress with accuracy previously unknown in the industry. For example, inspecting a site by foot can take days, even with a large crew. But with drones, the same information can be gathered and compiled by a single drone operator in only a few hours to help immediately and accurately analyze the data. 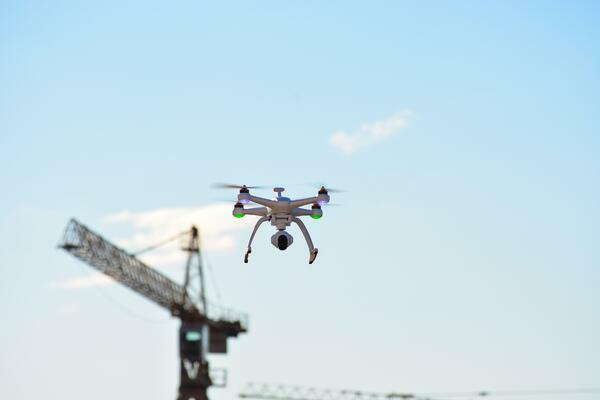 Because optimal construction processes and outcomes rely on good data, surveying and mapping tasks on construction sites are increasingly carried out by drone, and are on course to solve the problems that have been notorious for slowing projects. UAS can collect imagery and conduct aerial mapping of building sites with precise GPS-derived locations, creating nearly instant maps of areas challenging to traverse. Mapping innovations have also increased the integrity of plans at construction sites and allowed meaning to be extracted from captured data immediately. Using an operational intelligence platform, builders can turn drone sensor data into 3D structural models, topographical maps or volumetric measurements, which are useful for monitoring stockpiles and materials. Collectively, that intelligence allows construction companies to more efficiently deploy resources around a job site, minimize potential issues, cut costs and limit delays. A real-time intelligence solution can energize construction processes’ operational efficiency. For instance, with Simulyze’s operational intelligence (OI) platform, UAS operators can conduct tasks safely and efficiently with situational awareness and real-time data insight. Drone applications built on OI platforms can also incorporate big data sources and correlate them from any platform to standardize the information and provide in-depth intelligence, which enables a complete operational view of workflow data. This also provides deep analytics for insight into real-time events enabling informed decision-making. Proven applications like Simulyze’s Mission Insight support and manage the entire data workflow, from pre-operational planning to post-event analysis. Because UAS use is a less costly, more efficient and precise option, employing drones for construction operations is an ideal process that continues to gain considerable momentum and excitement. Schedule a demo today to learn more about the advantages that Operational Intelligence (OI) and UAS technology can offer the construction industry.